BRUSSELS (AP) — Brexit talks have made little progress, the European Union’s chief negotiator said Thursday, meaning they cannot yet be broadened beyond the terms of Britain’s exit to include key issues like future trade relations. Barnier said he would not be able to recommend to EU leaders meeting next week that “sufficient progress” has been made to broaden the talks to future EU-British relations, including trade. The leaders meet in Brussels on Oct. 19-20, and with time short to seal a deal it had been hoped they would agree to widen the talks. The EU says this can only happen when there has been progress on the issues of the financial settlement, the rights of citizens affected by Brexit and the status of the Northern Ireland-Ireland border. Many businesses are worried that Britain could leave the EU without a trade deal in place, which would mean tariffs on exports from both sides, reams of red tape and chaos at ports. The pound fell Thursday on news of the slow progress, trading 0.6 percent lower at $1.3142. Britain says its exit terms are closely intertwined with those on future relations like trade and must be discussed together. “I hope the member states will see the progress we have made and take a step forward” next week, British Brexit envoy David Davis told reporters. “We would like them to give Michel the means to broaden the negotiations. It’s up to them whether they do it. Clearly I think it’s in the interests of the United Kingdom and the European Union that they do,” Davis said. 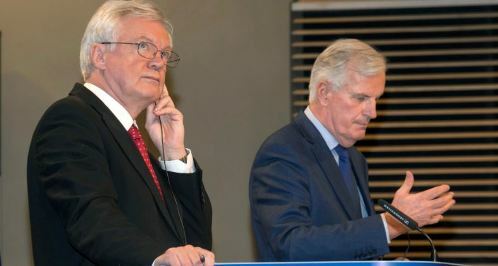 Despite the lack of progress, Barnier said the two would work to achieve “sufficient progress” in time for a subsequent meeting of EU leaders in December. Around one third of the negotiating time has already elapsed. Britain must leave the EU on March 29, 2019, but the talks must be completed within about a year to leave time for EU states’ national parliaments to ratify the Brexit agreement. European estimates on the size of the divorce bill have varied from around 60 billion euros to 100 billion euros ($70-120 billion), but Prime Minister Theresa May’s government has rejected such numbers without clearly explaining how the amount should be calculated. The negotiations appear to be moving at a snail’s pace, and each round leaves a sense of deja vu, with Barnier lamenting the lack of movement, and Davis appealing for more European flexibility. Thursday’s news conference, though, was brightened briefly by an unexpected visitor dressed as a superwoman promoting her book on why Europe needs one. “To be clear, on our side, we will be ready to face any eventualities, and all the eventualities,” he said. The British government is under pressure from euroskeptic lawmakers to increase planning for a “no deal” Brexit, without a trade agreement. Pro-Brexit lawmakers are urging May’s government to set aside money for new customs posts and other infrastructure that would be needed in the event of no deal. Some even say Britain should walk away from the negotiations if the EU does not agree to start the next phase by the end of the year. The Brexit spokesman for Britain’s opposition Labour Party, accused the government of risking a collapse in the talks with its infighting. He urged Davis to ask for an emergency round of talks before next week’s EU summit in an attempt to unblock the logjam.